This entry was posted on October 11, 2017 by Mari. 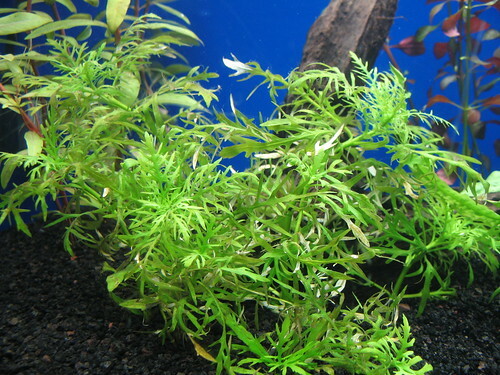 Hygrophila difformis, also known as water wisteria, is a popular aquarium stem plant. It's a great, fast-growing addition to any shrimp tank and its easy care even makes it suitable for beginners. 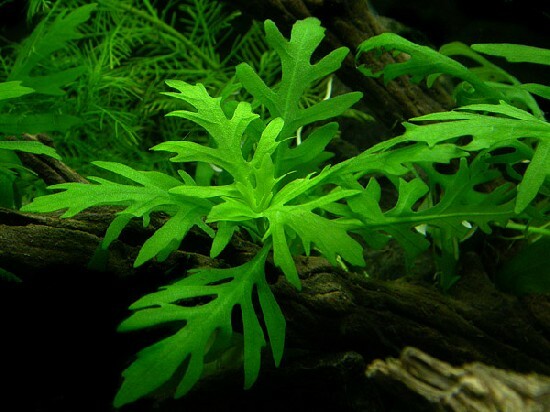 Its feathery, deep green leaves are sure to brighten up any aquascape! Keep reading for everything you need to know about water wisteria care and growing water wisteria in your own aquarium. Water wisteria is considered an easy aquarium plant suitable for beginners in the planted tank hobby. Added Co2 is not necessary to grow it (although it does always help) and just regular nutrient medium to high light should be enough to get this one growing very quickly. High light gives very finely feathered leaves while lower light conditions result in a less 'pretty' look. Do keep in mind that fast growth means lots of nutrients being used. Regular (micro)nutrient dosing is a good idea if you want to keep your water wisteria looking its best. Water quality isn't much of a concern with this plant. It can withstand a very wide range of water values and temperatures as long as plenty of light and nutrients are available. Temperatures between 68-86 °F and maybe even higher or lower are not a problem, which makes this plant perfect for unheated shrimp tanks. pH can be anywhere between 5 and 8. Water wisteria is a stem plant, which means it can grow very high and needs regular pruning to maintain a full and bushy look. To prune your water wisteria, just cut off the top with a pair of aquarium scissors. This helps keep its length in check and also create a full look: the 'beheaded' plant will grow multiple new shoots. Water wisteria has fine, feathered leaves and a bright green color. This makes for a very decorative, bushy plant with interesting texture that works perfectly in the background of any aquascape. Do keep in mind that it grows quite large (up to 23 inches! ), which means it works best for larger tanks unless you're prepared to prune very regularly. Like all stem plants, water wisteria will be appreciated by shrimp for the many hiding places and foraging grounds it offers. The feathered leaves offer a great hiding place for young shrimp, which comes in especially handy in community aquariums with potential predators. Water wisteria grows very quickly and can work well to keep a tank a little more stable by absorbing nitrates, which are harmful to shrimp and fish in large amounts. It can also help keep algae at bay by outcompeting them for nutrients. Emersed form - Like many aquarium plants, water wisteria is grown emersed in many plant nurseries. It might initially respond badly to being underwater: leaves might die off and the leaf shape can change a little. Propagation: As discussed above, water wisteria is a stem plant. This means propagation is easy, as you can just replant the tops you cut off while pruning. New roots will soon form and your water wisteria 'bush' will look even more lush than before. Water wisteria is a common aquarium plant and you shouldn't have too much trouble finding it at your local aquarium store. If you don't want to leave the comfort at your home, The Shrimp Farm also sells water wisteria and ships it right to your doorstep! You can find and buy water wisteria here.